This area consists of three Approved kindergarten rooms. 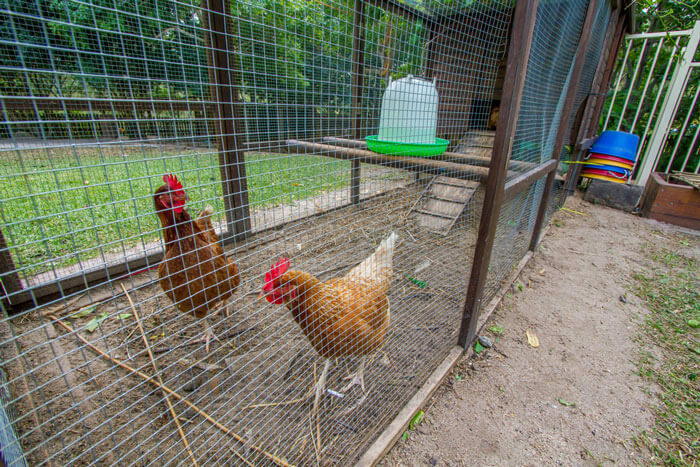 Children can enter the rooms at 3 or 4 years of age and continue with the same teacher and environment for up to 2 years. This allows children to develop a deep connection to their educators and become mentors for younger children as well as learning at their own pace. Kindergarten operates between 8.00 am to 3.30pm but you can access care from the hours between 6.15am to 6.15 pm like the rest of our service for wrap around care. 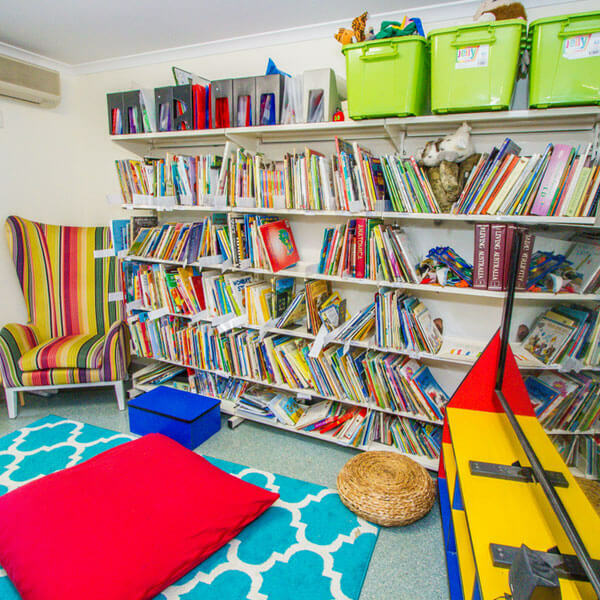 The children each have a home room where they make secure connections with particular teachers. Parts of the day are spent interacting within their own group, this may include, arriving, meetings, group discussions, intentional teaching sessions, sleeping/resting, meal times. 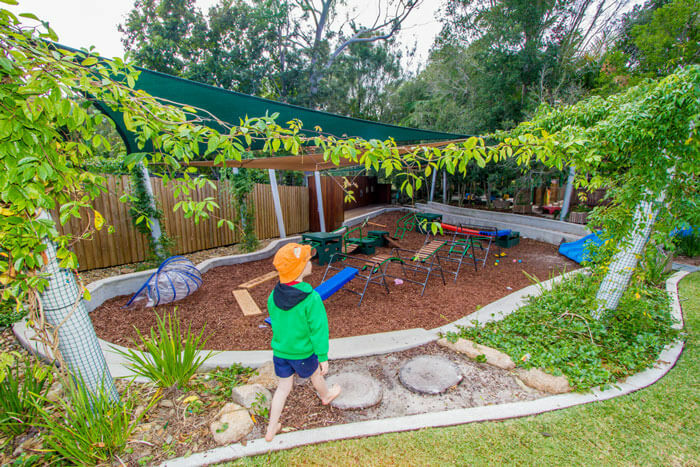 Other parts of the day allow children opportunity to explore both indoor and outdoor environments. Each kindergarten grouping consists of 22 children with 2 educators. 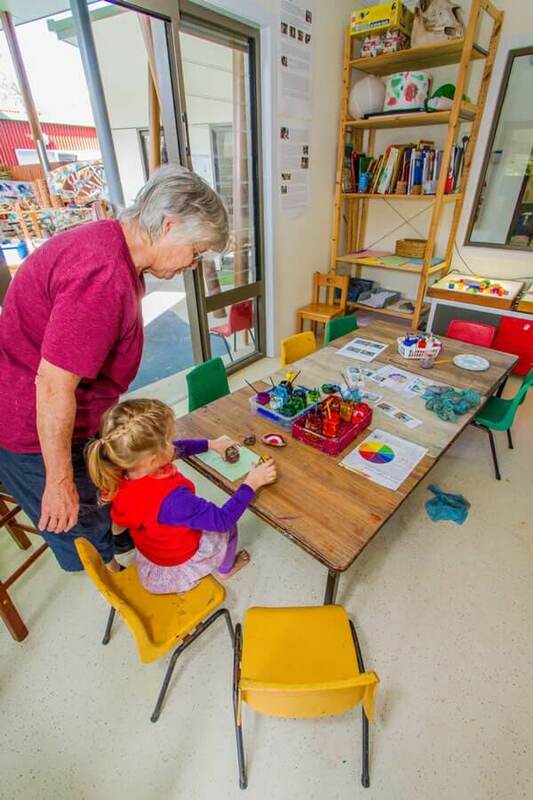 We also employ an additional Outside educator across the three rooms and an artist in residence. There may be additional staffing to support children with additional needs throughout our day. 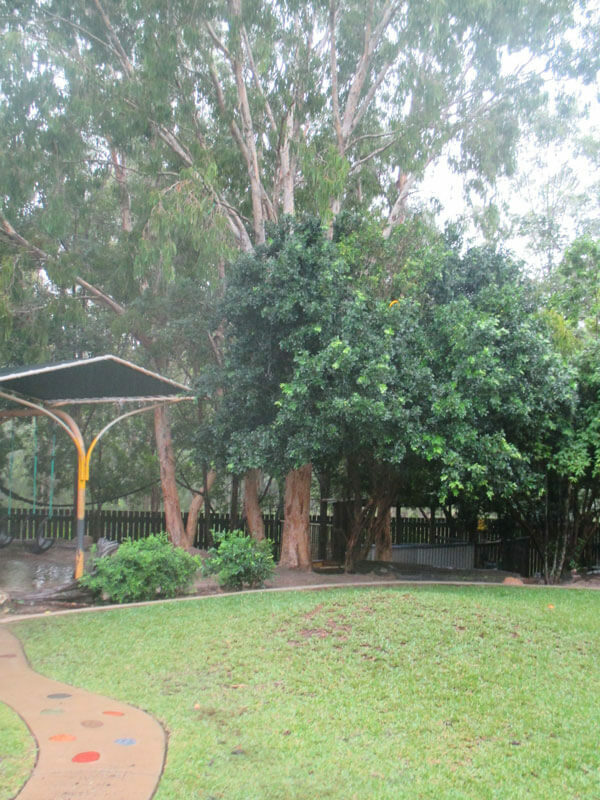 As these kindergarten programs are Approved Kindergartens under the Queensland Regulatory Authority (we have a 4 year trained Early Childhood teacher in each space ( Bachelor of Early childhood) as well as another educator. We also have an outside educator and other staff members to support the needs of these groups. 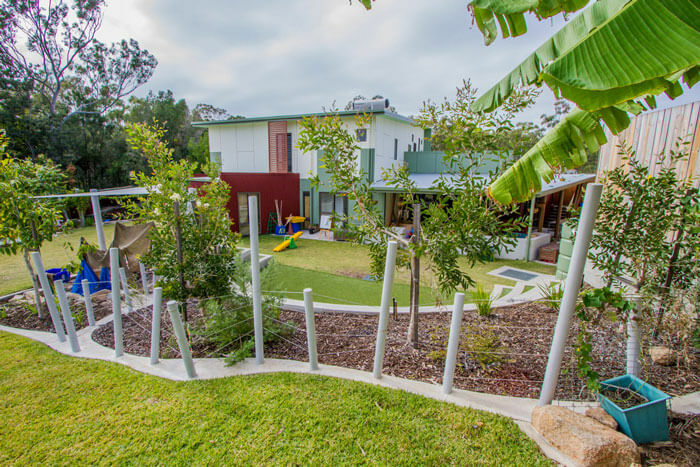 Our environments both inside and outside are planned to support children across many interests, to provoke thinking and to support many different types of play. 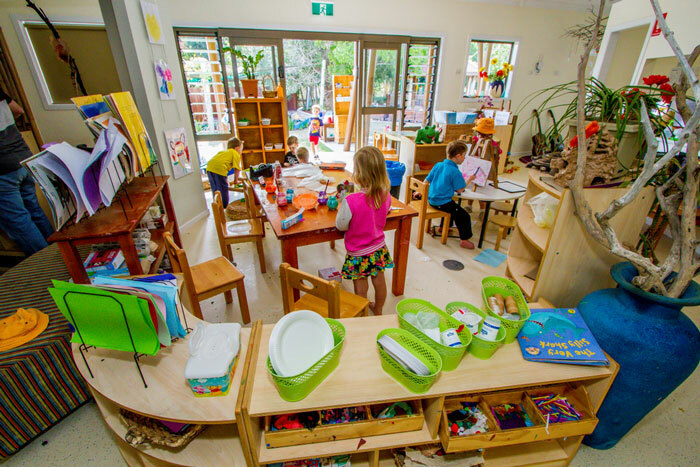 We have many stable and large learning zones, full of numerous open ended materials that can serve multiple purposes in play. 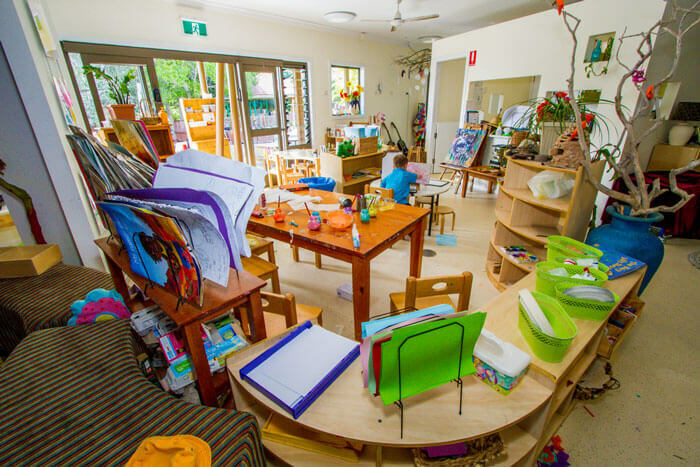 These environments build on the learning that occur in the younger rooms but are extended on to support goals for Kindy age children. We carefully consider and adapt our environments as we see what children are focussing on and what development we wish to promote. 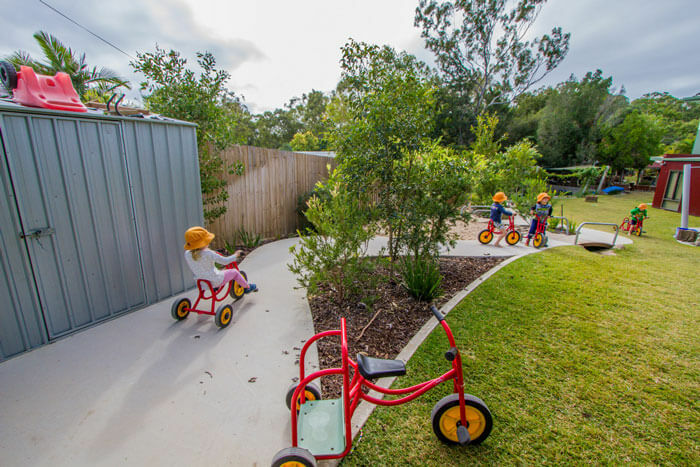 We strongly believe that long exposure to areas and materials give children a sense of security, it is also a way to encourage deep investigation, imagination, creativity, problem solving, and social skills. Large quantities of open ended materials which we call “LooseParts” are to be found in almost all areas of the centre. 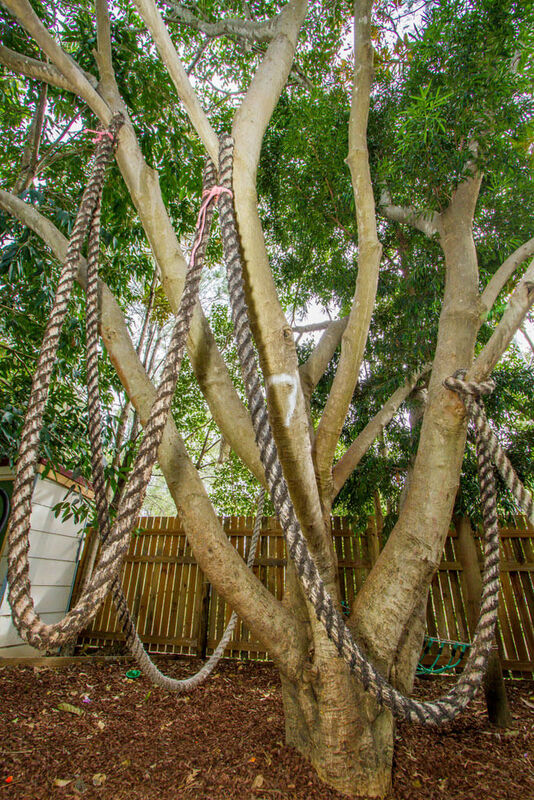 These unstructured materials are open to interpretation of the children. 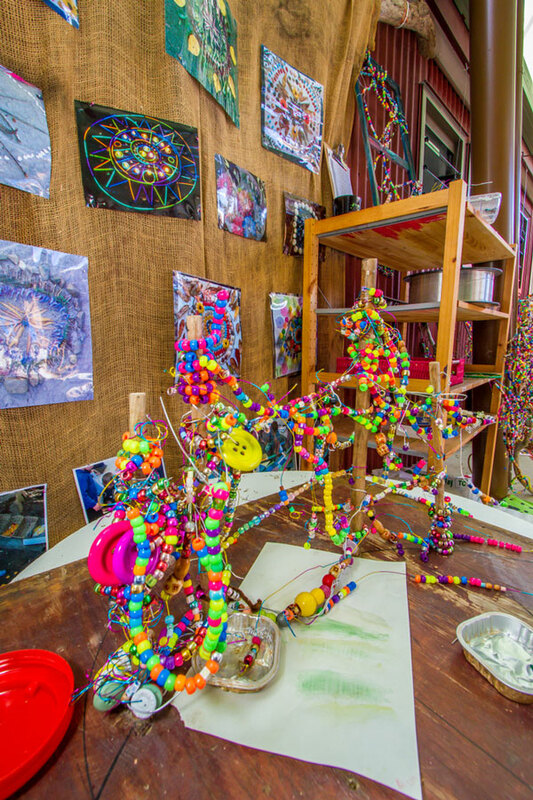 Visual arts spaces where we offer a large array of materials including paint, collage, play dough, drawing. 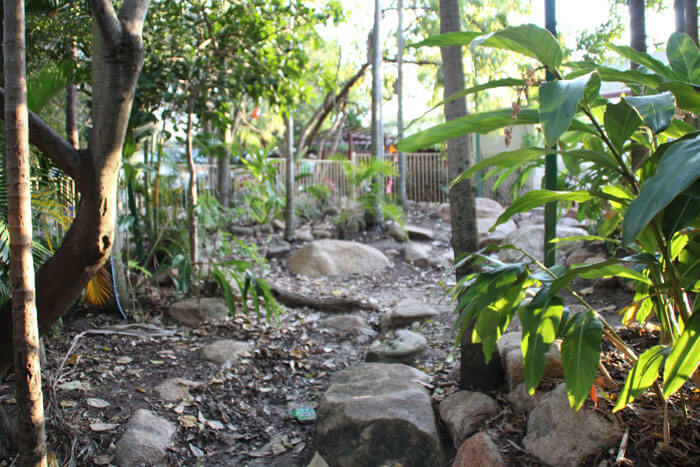 Roleplay spaces where children can develop understandings of community and the world around us. 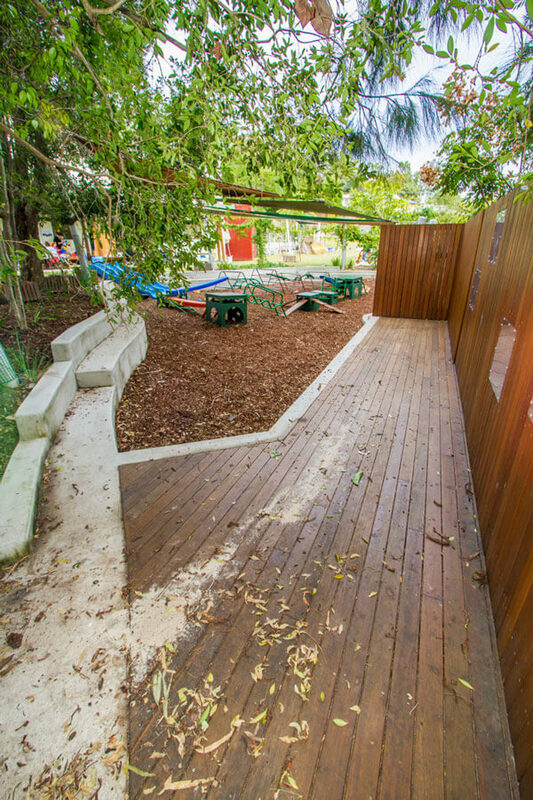 Large natural play spaces include dry creek beds, mud patches, rainforest areas, sand pits and mud patches. 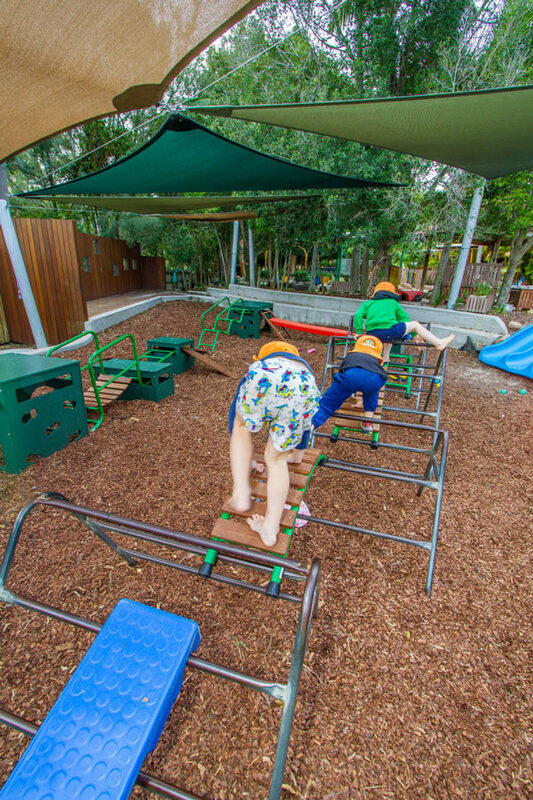 Physical play spaces like bike paths, large climbing zone, natural climbing obstacles. 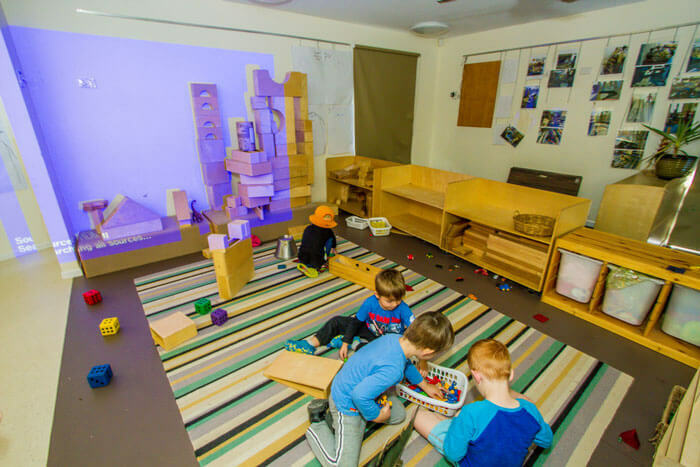 Construction spaces including blocks, materials for composition and manipulative materials. 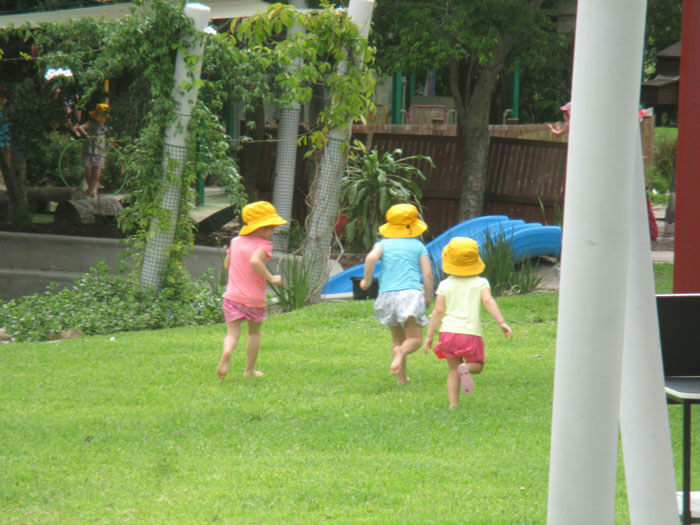 Kindergarten Age children are developing understandings of themselves and their environment at an incredible rate. They are striving for independence, have immense curiosity about the world and are developing their social identity. Three to five years old’s are rapidly developing a more complex understanding of concepts and are highly motivated to explore and set challenges for themselves. We view these children as competent individuals who are developing their understanding of citizenship and finding their agentic voice. They have a desire to make connection with others and to research and wonder about the world around them. We support their developing of questions and help them seek solutions encouraging them to theorise and test out ideas. We help children develop a cooperative culture in the rooms that supports taking risks and expressing ideas. We place high value on the consideration of relationships and understand that a young child’s burgeoning independence needs to be carefully supported. Educators act as consistent connection and safe space to be a springboard for children to engage in many experiences. 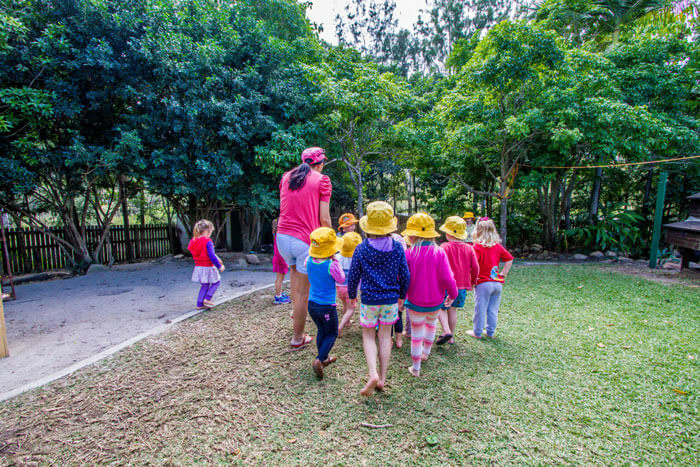 Kindergarten children need opportunities to explore and develop a wide range of skills in physicality, language, numeracy, socialisation, emotional and cognitive development. It is important that we provide high quality arts experiences in both materials and skill building. 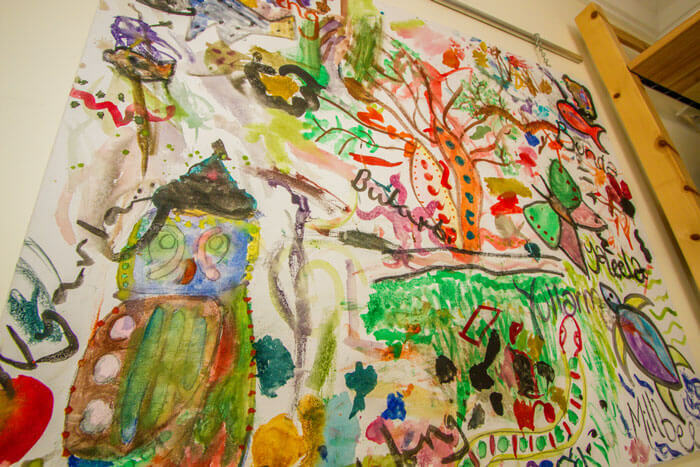 We believe that children are constructing understandings and concepts as they use the arts as a vehicle for self expression and representation about the world around us. 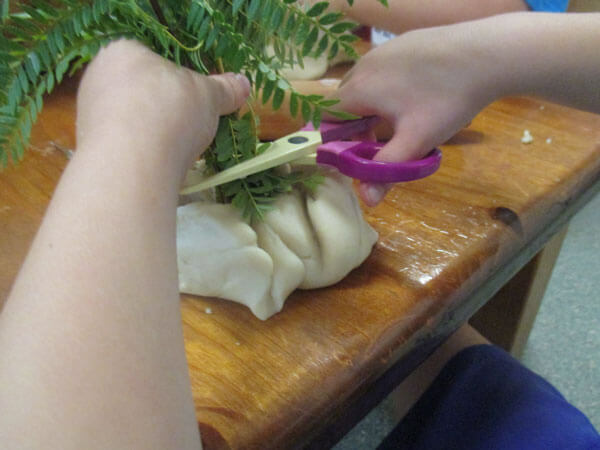 Our curriculum is built with the understanding that learning occurs for young children in a way that builds upon previous learned experiences and skills in a comfortable and familiar way, with people that are important to each child. Deep knowledge is created with the co construction of engaged educators that supports the offering of many ways to represent and build thinking through the arts. 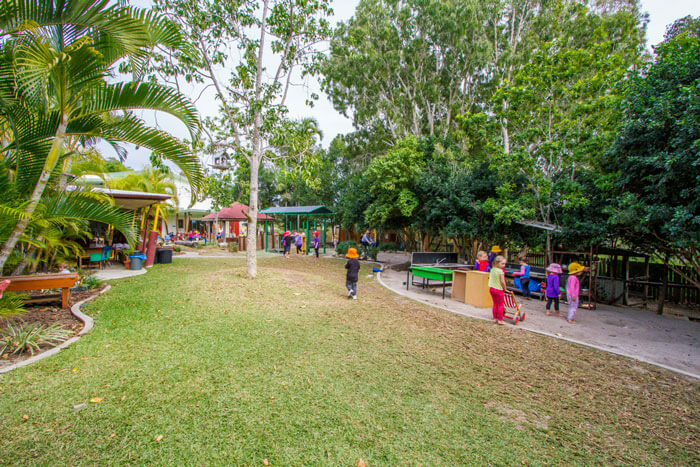 We create opportunities for exploration and creativity in a variety of planned environments and experiences that support learning across many learning spaces in small and large groups. 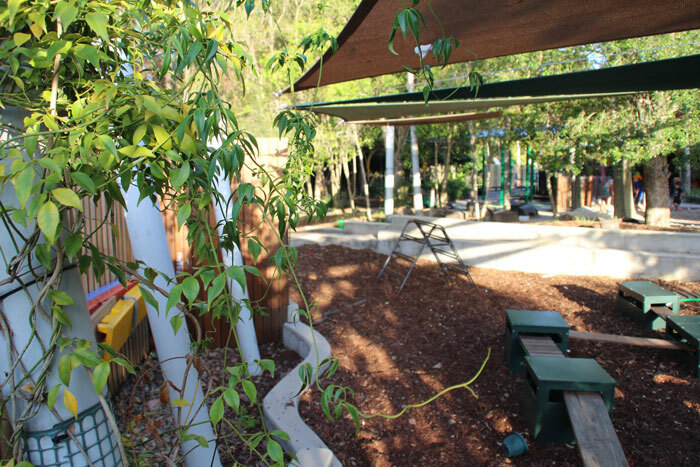 Our Kindergarten classes also use the Queensland Kindergarten Learning Guidelines (QKLG). These guidelines provide advice for planning, interacting with children, monitoring and assessing, and sharing information in a kindergarten context. The QKLG extends and elaborates on the concepts in the EYLF. 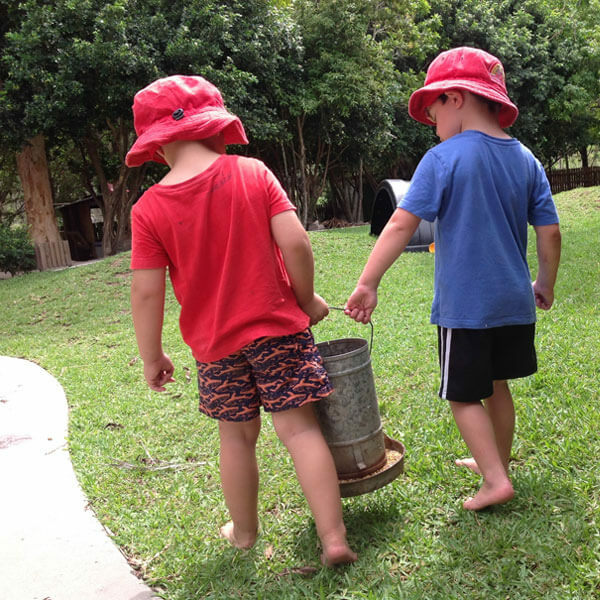 Embedded learning is created as we recognise the need for consistent yet flexible routines and rituals where children can feel they can predict the daily rhythm of our life at the centre. With these rituals we have many opportunities for the embedded learning of language, literacy, numeracy, social skills, sustainability and social justice through rich interactions and ongoing shared responsibilities of children and educators. This building of social skill and emotional regulation are supported through both planned regular experiences and spontaneous moments with particular goals for individual children. 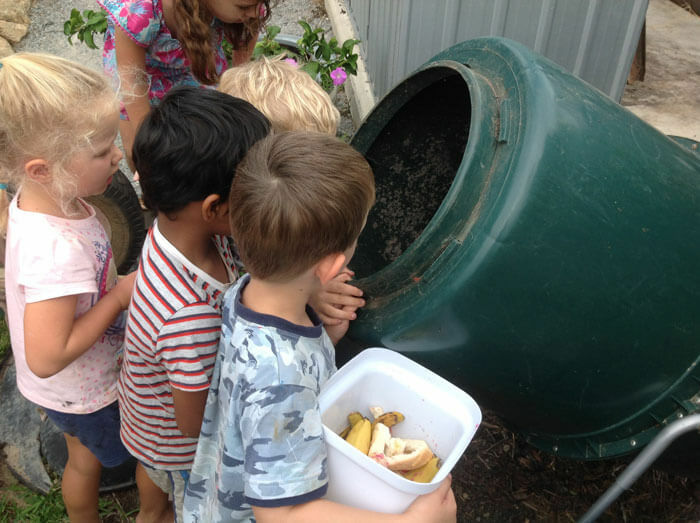 Within our regular rhythm of our day children will experiences times to come together socially at meal times, periods where they can rest or participate in other experiences as well as real life experiences such as gardening and cooking. Times for more formal group meetings of reflection and discussion are daily occurrences and help form part of the identity of each seperate kindergarten group. Sessions in music and Literacy occur at regular session each day. We also support the Abecedarian approach where all children are given opportunities to engage in Learning games, conversational reading and embedded language experiences. Our program is based on observations of the capabilities and interests of each child. 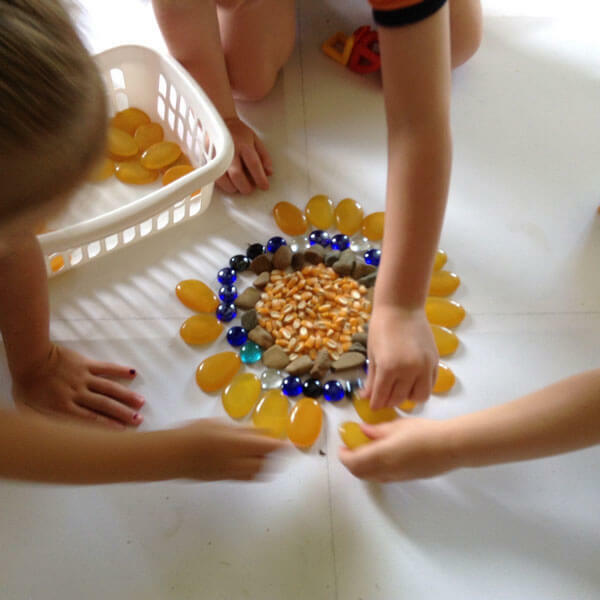 It is a strongly emergent curriculum where children become co constructors of the world around them. This means that educators observe, support and facilitate learning in areas that the children are interested in extending and thinking about. 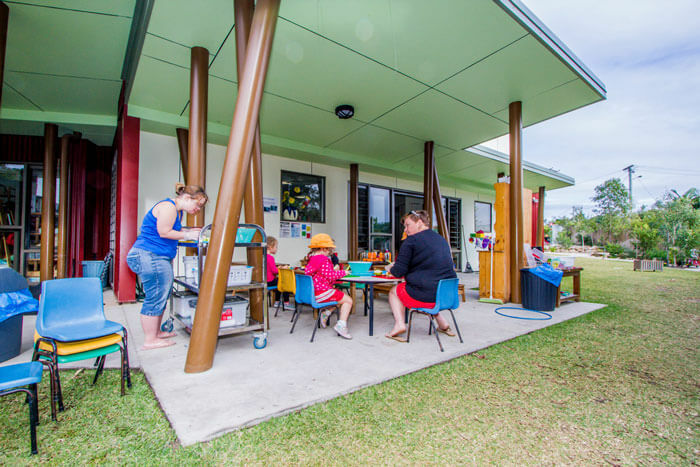 Educators use the learning outcomes in the Early Years Learning Framework to plan for and implement Particular learning goals as children are playing in our large learning spaces. 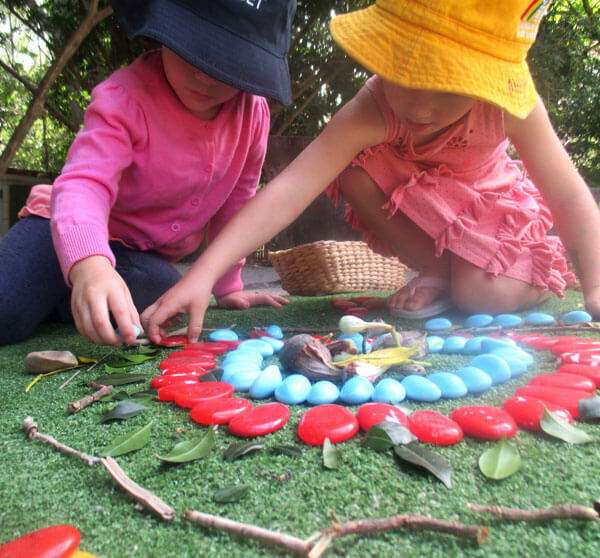 Play is supported in many different ways across our day as it is children’s way of refining skills, expressing ideas, investigating, interpreting and exploring the world around them. Regular times to engage with a particular activity are also given to build skills in the arts as well as supporting our wellbeing. 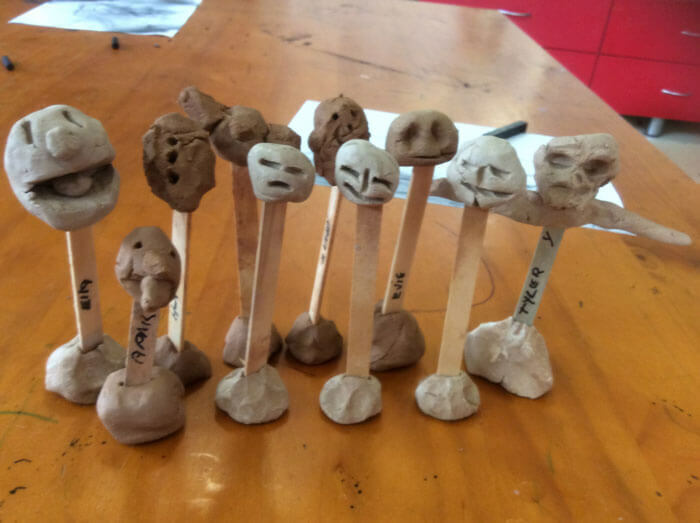 Children may be offered ongoing small group workshops in clay, wire, tools (scissors, tape, glue) which build basic fine motor skill, group collaboration, problem solving, creativity and individual expression. 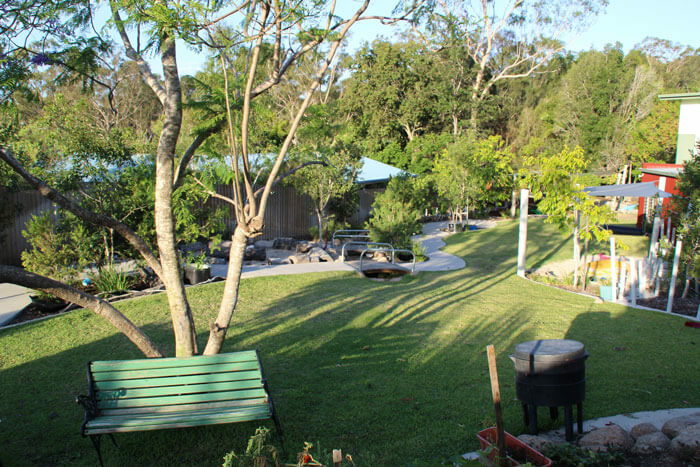 Alternatively workshops involving drama experiences and yoga are offered to build understandings of oneself, personal mindfulness and self expression. The capabilities and interests of children are supported through ongoing projects where the co construction of knowledge and investigation of ideas through the arts produces a deep authentic conceptual knowledge and high level of skills. Projects can occur as short investigations or long and ongoing experiences throughout the year. Investigation into particular topics or ideas are introduced by teachers with many involving a resident artist. Children may also stimulate the introduction of a project through the offering of questions or interest to further investigate as a group.We support their developing of questions and help them seek solutions and encourage them to theorise and test out ideas. Our Arts studio forms a hub between all three kindergarten rooms, the employment of a special Arts educator and regular visiting artist is an exciting and unique part of our program. Children have daily experiences in the studio to develop particular skills and explore their creativity in the visual arts. 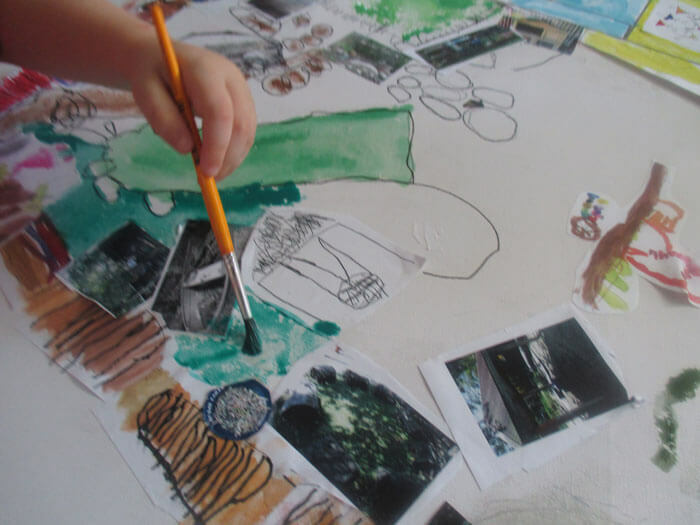 Small group investigations may take place with visiting artist to introduce new skills or to investigate ideas and concepts about the world around us. 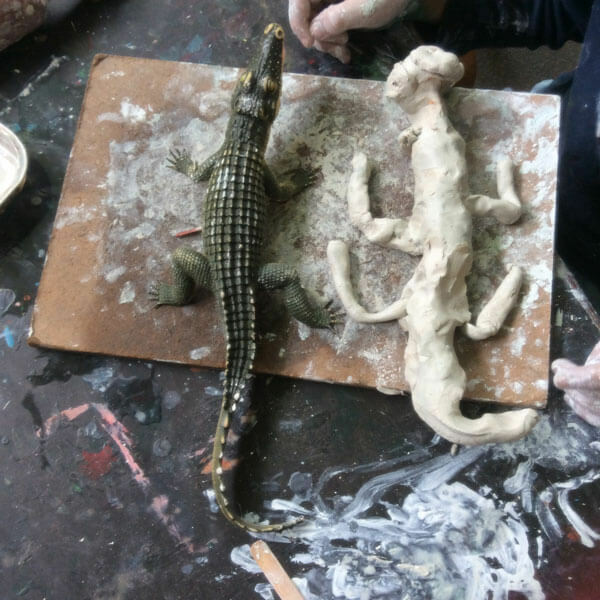 Regular opportunities to explore clay, wire, drawing and technologies are offered on a regular basis. Our seperate library space is a special place where we keep our extensive collection of books. 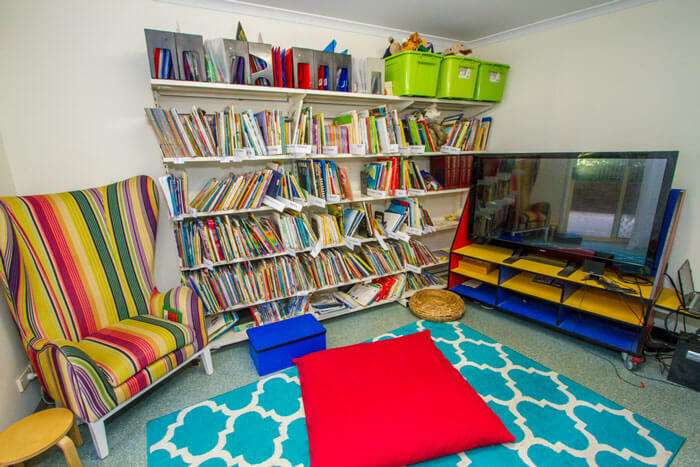 In this place children can have meetings away from the larger group, to research particular topics and use digital technologies to support their learning.